The indoor environmental professionals at Clark Seif Clark (CSC) provide environmental consulting and testing services following building fires. Even rebuilding efforts after a fire can create situations that could expose building occupants and workers to potential hazards in some older buildings when lead-based paints or asbestos containing materials are present. Fire departments across the United States respond to over 1 million fires of all types according to the U.S. Fire Administration. Many of these fires take place in people’s homes and businesses and in addition to causing injuries and deaths in some circumstances, also result in billions of dollars in property damage. While some fires cause the complete destruction of a building, many times the efforts of fire fighters and fire suppression systems localize the damage to just a part of the structure. Depending on the size of the fire, type of building it takes place in and proximity to other homes or buildings, it is possible for there to be additional property damage not caused by flames that may not always be immediately evident. This damage could be in other parts of the same building, such as in adjacent units in an apartment or office complex, or even in nearby buildings not directly touched by flames. 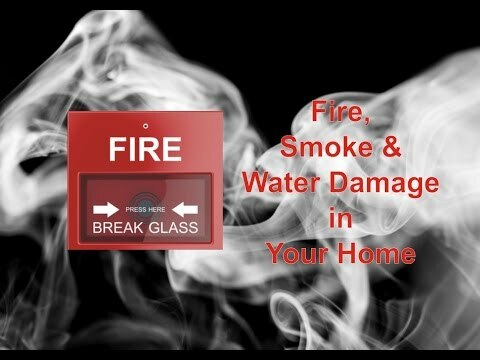 Two common causes of property damage include smoke and water damage. Smoke is filled with combustion by-products that include soot, ash and char that can easily infiltrate adjoining properties and nearby buildings. It can have damaging effects to both properties and to humans breathing the polluted air. In addition to leaving behind unpleasant odors, smoke residues can cause corrosion, etching and discoloration within a property. Fire sprinkler systems and the efforts of fire fighters can release a tremendous amount of water into and onto a building fire. Water used to put out a fire in a third floor apartment will makes its way down to the lowest level it can reach resulting in water damage on multiple floors. This may leave obvious signs of damage, such as water logged floors, but even water and moisture trapped behind walls and ceilings can cause property damage and quickly lead to the growth of mold. To learn more about this or other indoor air quality and environmental, health and safety services, please visit www.csceng.com, email csc@csceng.com or call (800) 807-1118.